For both artists, The Olms marks an impressive first attempt at true musical collaboration; both men have worked with other artists but have only written songs in solo mode. Below, Yorn talks about taking on his first songwriting partner, vibing out in King’s Los Angeles home, and finding inspiration in a cave-dwelling amphibian. You’ve worked alone for so long. Were you itching to collaborate prior to this, or was it more about working with J.D.? Well, I wasn’t really thinking I was going to write a bunch of songs with J.D. or anything like that. I just started hanging out in his studio, and it kind of started happening; it surprised both of us, I think. It was an interesting way to experiment with my own process. I’ve always been such a solitary writer, and I really do like coming up with my own ideas, but sometimes it’s cool to just collaborate, and I know that I’ll take what I learned with J.D. back to my own songwriting. What do you think you guys brought out in each other? I think any time you add something else into the mix, it’s going to stir things up a little. But we’re good at finishing each other’s thoughts, I guess. We both have a germ of an idea, and if we sit and work on it together, we can tap into where the other person’s coming from and run with it. He comes from a piano background, and he knows a different batch of chords than I know. I feel like every songwriter has their signature chords, so we kind of blended ours together; I taught him some new chords, and he taught me some new chords. How did you come up with The Olms? We didn’t really know what to call it. We saw ourselves as two songwriters getting together, so we figured we’d call it “J.D. 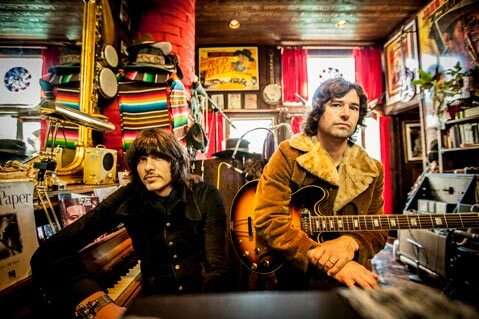 King and Pete Yorn” or “J.D. and Pete” or “Pete and J.D.” [Laughs.] Then someone sent me a couple of band names one day, just for fun, and one of them was The Olms. I didn’t even know what it was, but I liked the sound of it so looked it up and found out that it was this blind amphibian that lives in caves. I sent it to J.D., and we just kind of ran with it. It’s fun just to disappear into a project sometimes. I find a lot of artists, they start a band, and then they want to go solo. For J.D. and I, it was fun to just become The Olms for a little bit. Speaking of caves, the house you recorded this thing in is quite a place. Do you recall the first time J.D. invited you over? I remember the first time I walked in there, it was like, “Whoa.” It felt like a movie set. It’s a really heavy vibe when you walk in there, and it can’t help but influence the music that you write when you’re in there, as well. There’s a lot of stuff on the walls that could evoke something. It’s a fun place to work. That’s where we do all our rehearsals, too. It’s always a good place to come back to. Were there albums that you guys listened to when you were recording? I don’t remember listening to a whole bunch of music. J.D. would always talk about Tony Rice. I don’t hear it so much in The Olms record, but he was really into that guy’s guitar playing at the time. For me, I just had a lot of sounds in my head, I guess. And we recorded to tape, which has a sound of its own. I remember J.D. had this reel-to-reel machine, and he had a Paul McCartney tape on there, and it sounded amazing. It had such a good, pristine sound. Whose idea was it to record to vintage tape? J.D. is definitely more of the purist. I have things that I like in a lot of different mediums, but his ear is more attuned to that old sound. He’s listened to stuff from the ’20s and ’30s; he collects 78s. My thing is that I know there were great records made on tape, and that there were many more crap records recorded on tape. [Laughs.] It’s the same thing with digital. It’s fun to get romantic about that stuff, but if you have a good batch of songs and you lay ’em down in a compelling way, you’re going to end up with a good record. The Olms play SOhO Restaurant & Music Club (1221 State St.) on Wednesday, December 4, at 8:30 p.m. Call (805) 962-7776 or visit ticketweb.com for tickets and info.